This is a phylogenetic tree constructed from nucleotide data from 41 viral complete ORF sequences of ZIKV strains by the maximum likelihood-method logarithm in MEGA7 based on the Tamura-Nei model. A bootstrap percentage for 1,000 replicates was shown on the left. Branches corresponding to partitions reproduced in less than 70% of bootstrap replicates are not shown. Strains isolated from human, mosquito, and monkey (NIH reference strain) were labeled with blue, orange, and black circles, respectively. The two subtypes were labeled on the right side of the tree. The new strains Rio-U1 and Rio-S1 were highlighted using (*). An analysis comparing the individual differences between over 40 strains of Zika virus (30 isolated from humans, 10 from mosquitoes, and 1 from monkeys) has identified significant changes in both amino acid and nucleotide sequences during the past half-century. The data, published April 15 in Cell Host & Microbe, support a strong divergence between the Asian and African lineages as well as human and mosquito isolates of the virus, and will likely be helpful as researchers flush out how a relatively unknown pathogen led to the current outbreak. 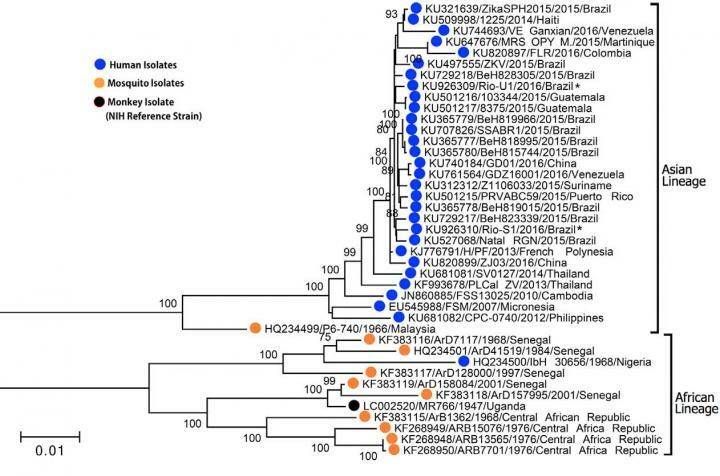 All contemporary human Zika virus strains share a more similar sequence to the Malaysian/1966 strain than the Nigerian/1968 strain, suggesting the strains in the recent human outbreak evolved from the Asian lineage. All human strains identified in the 2015-2016 epidemic appear to be more closely related to the French Polynesia/2013 strain than the Micronesia/2007 strain, suggesting that the two variants evolved from a common ancestor. The prM (pre-membrane precursor) protein of the Zika virus had the highest percentage variability between the Asian human and the African mosquito subtypes, and modeling suggests that some of this variability contributes to a significant structural change. Future sequencing work will likely focus on understanding the Zika strain causing the 2015-2016 epidemic, which has yet to be isolated from a mosquito. Cheng’s group and others will also begin to elucidate the structure of the viral proteins, which can inform drug and vaccine design. “We hope that our work provides a strong basis that will help the larger scientific community in accelerating Zika virus research,” he says. This work was supported by the National Institutes of Health; the Ministry of Science and Technology of China; the National Natural Science Foundation of China; and the Institutional Research Fund for Thousand Talents Program at Chinese Academy of Medical Sciences. Cell Host & Microbe (@cellhostmicrobe), published by Cell Press, is a monthly journal that publishes novel findings and translational studies related to microbes (which include bacteria, fungi, parasites, and viruses). The unifying theme is the integrated study of microbes in conjunction and communication with each other, their host, and the cellular environment they inhabit. Learn more: http://www.cell.com/cell-host-microbe. To receive Cell Press media alerts, contact press@cell.com.